Whitby Town had to settle for a point despite a strong display at promotion-chasing Peak District side Buxton, on Saturday. 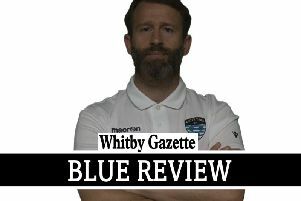 “We deserved the three points,” player-manager Darren Williams told the Whitby Gazette. “We’ve done enough, we’ve created chances but we aren’t prolific enough in front of goal,” he added. Williams made one change from the team that forced a last gasp draw at home to Belper seven days earlier, sacrificing himself for midfielder Lee Mason. This clash was in doubt for much of the morning as snow fell heavily at a ground that stands 1,000ft above sea level – the highest in English senior football. When it melted, Buxton FC appealed for locals to help them fork the Silverlands surface. When we did get under way, both sides struggled to threaten, though the NPL Premier’s leading scorer, 20-goal Liam Hardy, did force Shane Bland into a good save low to his right, on nine minutes. Town came into the match as the first half wore on. Dale Hopson’s rising effort was held above his head by Arron Jameson around the half-hour mark, before Mason sliced just wide of the keeper’s left hand post from the edge of the penalty area. A quickly-taken throw then caught out the Seasiders and when Hardy beat marker James King, he was able to drill across Bland from the right-edge of the box, squeezing the ball between Town’s number one and his right-hand post. Williams was not happy. “I know referees take a lot of stick, but when the ball goes out of play right next to me, then I see the referee allowing the throw to be taken six or seven yards further forward,” he fumed. The visitors then had their best spell as strike duo Steven Snaith and James Brown, both ex-Hartlepool United, had shots charged down during more than one penalty box scramble. Half-time may have come at a bad time for the Seasiders but Williams insisted his team talk barely changed. “It didn’t alter much,” he said. “I felt we were well and truly in the game. “Bar pointing out the disappointment of conceding a goal, there’s not much to say apart from to keep going,” he insisted. Town began the second half well but the game nearly boiled over on the hour as players from both sides waded into a long halfway line shoving match. Snaith fell onto the ball on halfway, between the two dugouts, with Laurie Wilson kicking through the back of Snaith, then continuing to kick the striker as he searched for the elusive football. Mason and Dave McTiernan took exception and were yellow-carded alongside Buxton’s Alex Byrne and debutant Rhys Mernell after Williams and opposite number Martin McIntosh went onto the field to calm things down. “Martin’s pointed out that their full back’s kicked out at our lad and he’s been honest and said he can’t condone things like that,” Williams said. “The lad should’ve left the field – if the referee had taken a stern view from the outset, it wouldn’t have escalated,” he continued. Fortune then turned Town’s way as Mason heeded Williams’ advice to shoot more, firing an angled left-edge of the box shot that Jameson dived early to block, only for the ball to skip up and over the helpless keeper and inside the far corner. Williams threw on forward Robert Nolan for Brown as Town looked to win it in the last 20 minutes. Niall Doran then replaced Mason in midfield, as he came close to talking himself into a second booking and almost slid over a Buxton player. McIntosh brought on the ever-dangerous Mark Reed up front for former Matlock marksman Shaun Tuton and he quickly forced Bland to Bland react suddenly and block in the six-yard box, appearing to almost do the splits in the process. At the other end, Doran toe-poked straight at Jameson, who clutched low to his right. Nolan then volleyed into the side netting from an awkward ball, dropping over his left shoulder, on the left flank and later the former Blyth frontman was denied by Jameson’s early full-length sprawl forwards after a bright run. Buxton always looked dangerous on the break and substitute Neil Stevens narrowly eluded the crossbar from 20 yards, while Reed’s deft flick header dropped just over the top from Alastair Taylor’s right-wing cross. Whitby Town: Bland, Hassan, Robinson (Shepherd 85), Burgess, Pell, McTiernan, Mason (Doran 74), Hopson, Brown (Nolan 70), Snaith, King. Subs not used: Bullock, Waters.